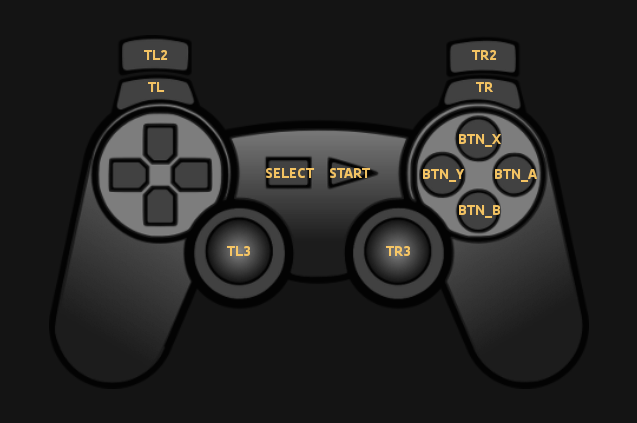 A button mapping is a text file that tells RetroX which button or key will be sent to the emulator when you press a button in your gamepad or touchscreen controller. Games included with RetroX don’t need mappings, we already have done that work for you and the appropriate mapping will be installed automatically. If you want to change the button mappings for your game, or your game is not supported, continue reading. RetroX uses a “standard” gamepad layout. This layout is based on the Super Nintendo gamepad layout and it is expanded with additional buttons available in controllers like the Playstation and XBOX ones. Some games for computer platforms like Atari, MS-DOS, MSX or Amiga were designed to be played with a keyboard and/or a joystick with one or two buttons. As this gamepad layout supports up to 10 buttons, you can assign those additional buttons to send key events, for example pressing the SPACE bar, the ESC key or any other key that the game requires. With that line, when you press the BTN_X button in the “standard” layout, the emulator will receive the SPACE keypress. In the games supported by RetroX we have improved some games controls adding a special button for “jump”. In those games where you jump moving the dpad up, we simply mapped the up action to the BTN_A key, so for example the user now can fire with the BTN_B and jump with BTN_A, something that were not supported in the original game. Those files must be in the folder containing the game.